UNC Chapel Hill's new interim chancellor, Kevin Guskiewicz, addresses reporters at the Carolina Inn on Thursday, Feb. 7. UNC-Chapel Hill’s new leader has denounced yearbook photos from the 1970s depicting fraternity members from the university dressed in blackface. The photos surfaced yesterday and have since caused outrage on social media. One of the photos, from the fraternity pages of a 1979 UNC yearbook, posted on Twitter by News and Observer reporter Colin Campbell shows two men dressed in Ku Klux Klan robes pretending to lynch a third man wearing blackface, from a light fixture. The yearbook photos were widely circulated on social media yesterday afternoon, just as UNC System Interim President Bill Roper’s selection for interim chancellor was announced. 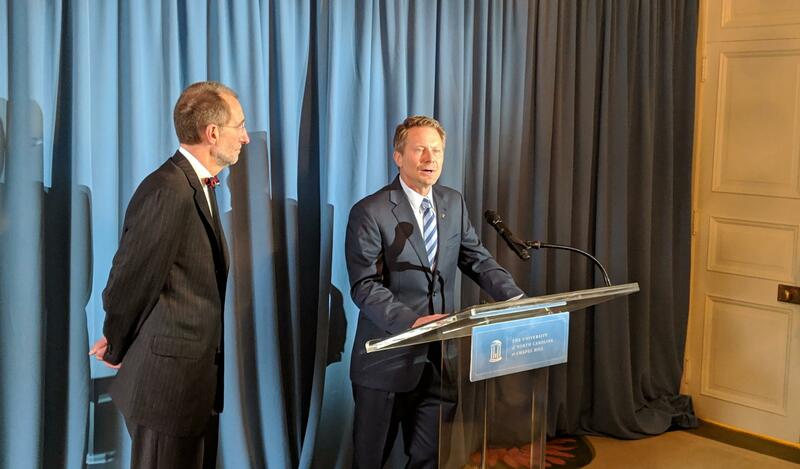 Guskiewicz, who has worked at UNC for nearly 24 years, previously served as dean of the university’s College of Arts and Sciences and is a neuroscientist who studies sports-related traumatic brain injuries. Roper told reporters Thursday he chose Guskiewicz, in part, because he’s on the record saying the Confederate monument known as Silent Sam has no place on the UNC-Chapel Hill campus. “That said, we have a process before us and we need to be working with the Board of Trustees, the Board of Governors and others in positions of authority in our state in a lawful and respectful manner to create a way forward that allows us to learn from the past and then be prepared for the future, in a good way,” Roper said. As UNC-Chapel Hill’s new interim chancellor, Guskiewicz will work with the campus trustees and five members of the UNC Board of Governors to come up with a new plan for Silent Sam. The proposal is due to the system’s highest board by March 15. Guskiewicz’s predecessor, Carol Folt, announced her resignation last month. In the same email she ordered the removal of the base of Silent Sam from campus. Folt had planned to stay through spring commencement, but the UNC Board of Governors ordered her out on Jan. 31. UNC Chapel Hill Faculty Want Say In Silent Sam's Future. Will They Get It? Lisa Philip reports on a request by UNC Chapel Hill faculty to be included by university officials in planning for the future of the Confederate statute known as Silent Sam. Members of the UNC Chapel Hill faculty are trying to secure a say in new deliberations about Silent Sam, the Confederate monument protesters tore down from the campus last August. But it’s unclear whether or not, and to what extent, they will be given one. Lisa Philip reports on a celebration in downtown Chapel Hill to mark the removal of the Silent Sam pedestal from the UNC campus. Activists gathered Tuesday night for what they called a victory party across the street from the now-empty ground on which the Confederate statue known as "Silent Sam" once stood. Attendees chatted over free pizza and Kendrick Lamar’s "Humble." The University of North Carolina - Chapel Hill has a new interim chancellor.